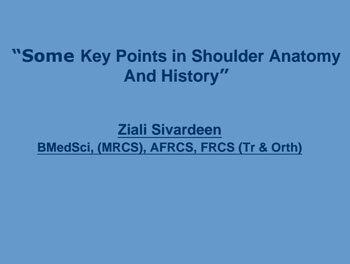 The shoulder is made of complex bones and joints linked by ligaments, tendons and muscles to the chest bone (sternum), neck (cervical spine) and chest (thorax). Pain can be due to an injury, can be due mechanical problems (such as subacromial impingement or instability), inflammation (such as arthritis, bursitis), wear and tear (such as rotator cuff tears) or linked to the nerves. 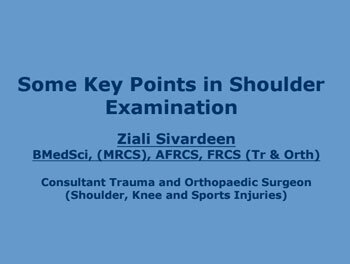 Assessment of shoulder pain depends largely on a careful history and physical examination and special imaging such as x-rays, ultrasound, CT or MRI scans may be required to give the diagnosis. Biceps tendon: felt at the front of the top of the arm, particularly when lifting the arm forwards. Rotator cuff and subacromial bursa: often felt in the top of the arm in the deltoid muscle, with radiation down the side of the arm towards the elbow. Tends to be worse when raising of the arm to the side. Acromioclavicular joint: localised to the joint itself, but may go into the neck or back over the shoulder blade. Tends to be worse when the arm is raised high to the side or when reaching across the chest toward the other shoulder. Usually the cause can be easily identified and treated, and in some cases this may require physiotherapy, injections or surgery. Occasionally no structural or pathological problem can be identified and therefore pain management is important to relieve symptoms and maintain function.